Equip your minimally invasive surgery practice with the visualization and control enabled by da Vinci® systems. Da Vinci urologic surgeons use the da Vinci system and advanced instruments to perform prostatectomies, cystectomies, partial nephrectomies, pyeloplasties, and procedures for other urologic conditions. For urologic surgeons, the da Vinci Xi® offers more options than the previous da Vinci® system. It delivers multi-quadrant access with the versatility you need for a variety of urologic procedures. It features our advanced instrumentation and vision, and integrated table motion. Watch this 1 minute excerpt showing the use of the EndoWrist Stapler 45 in a prostatectomy peformed by Dr.Lau. Full length (3 hours 50 minutes) video showing Dr. Delworth performing a cystectomy with intracorporeal diversion and neobladder. Video includes narration from Dr. Delworth throughout the procedure. Full length (1 hour 17 minutes) video showing Dr. Porter performing a Retroperitoneal Partial Nephrectomy. Video includes narration from Dr. Porter throughout the procedure. Full length (1 hour 24 minutes) video showing Dr. Porter performing a prostatectomy. Video includes narration from Dr. Porter throughout the procedure. Full length (2 hour) video showing Dr. Peters performing a pediatric ureteral reimplant. Video includes narration from Dr. Peters throughout the procedure. Full Length (2 hours, 7 min.) 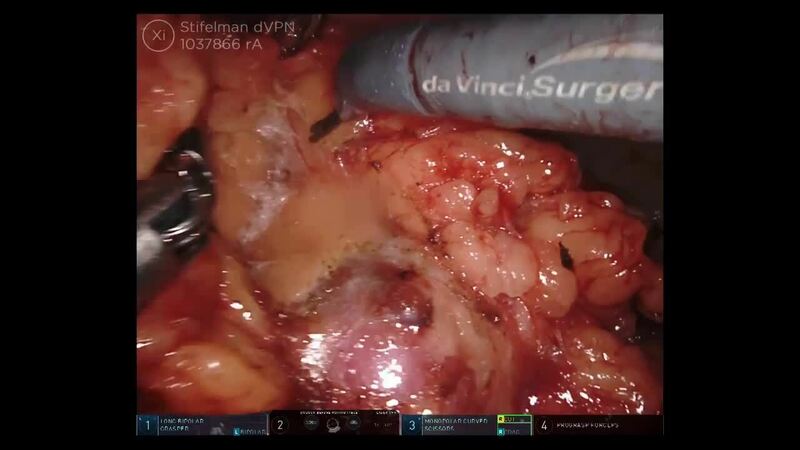 video featuring Dr. Stifelman performing a Partial Nephrectomy on the da Vinci Xi Surgical System. Full length (1 hour 13 minutes) video of Dr. Michael Stifleman and Dr. Craig Rogers performing a pyeloplasty. Video includes narration from both Dr. Stifelman and Dr. Rogers throughout the procedure. Visit website Artboard Created with Sketch. The fellowship will provide an important training mechanism for urologists interested in learning minimally invasive robotic-assisted surgical techniques. This is a one year unaccredited clinical fellowship open to US graduates who have completed a urology residency program. The goal of the fellowship is to thoughtfully apply robotic-assisted and minimally invasive surgery with the da Vinci Xi® system for the spectrum of urologic disease from oncology to reconstruction.